The sealing machine is designed for the sealing using a thermoplastic gasket between two electrodes in the application of dye-sensitized solar cells (DSSC). It provides the user with a convenient, rapid, safe, reliable and repeatable method for the assembly of DSSC. 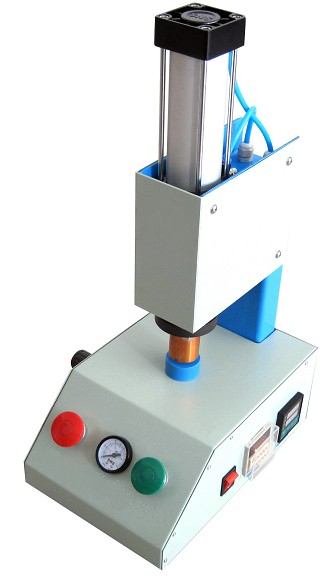 The sealing machine is flexible and suitable for cells with the dimension of < 25 mm × 25 mm. During a selected period of time a controlled pressure and temperature can be applied. The temperature range is 20 - 399 °C and the applied pressure corresponds to 400 - 2 000 N force. A compressed air or N2 source (< 1.0 MPa) is required for operation. The machine can also be used for closing filling holes. Members of the Centre for Molecular Devices is successfully using this tool since several years.